Out of 40 students competing in the finals of the Regeneron Science Talent Search in Washington, D.C., only 10 students received prizes. — and one of them is from Westview High School in Beaverton! 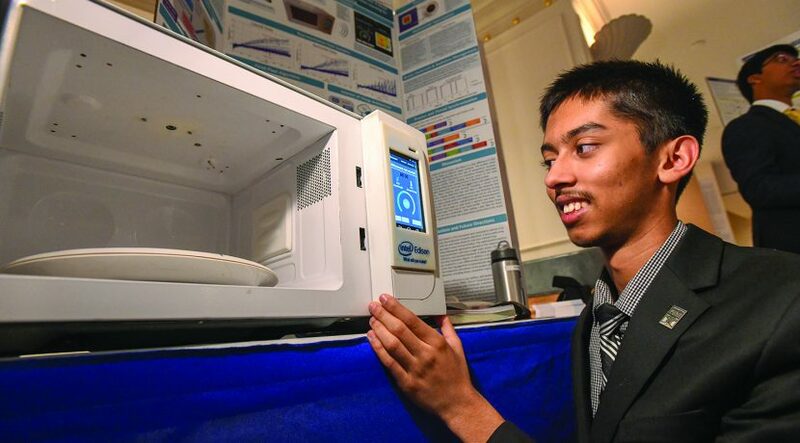 Shahir Rahman, a senior at Westview, invented microwave technology that heats different items on a plate to their respective ideal temperatures. He wowed the judges with his “smart” microwave that cooked chicken and rice to their desired temperature, while leaving the salad on the plate cool. Rahman also produced a smartphone application that gives the user the power to adjust their preferred temperatures for certain foods. For this innovative project, Rahman won fourth place and a cash prize of $100,000! Rahman has been working on this project for the last three years, with the help of his father, an engineer at Intel. He plans to attend college at MIT this fall and hopes to continue to work on projects that will positively impact the world, he says. "Most of my projects are about ordinary ideas for ordinary people, but they have a great impact in the solution. It all starts with an idea." Calling all 2018 graduates! Is there someone in your life that you’d like to thank for helping you reach your goal of getting that diploma? Now is the time to give them thanks and potentially win a $1,000 prize! The Promise of Oregon has announced the #GRADitudeOR video contest program for high school seniors who are on track to graduate. Students who wish to enter the contest must create a video that is two minutes or less in length and upload it to their social media accounts by May 26, 2018. The judges are looking for creativity and sincerity, and the winner will receive a $1,000 college scholarship. For more information and eligibility requirements, visit http://promiseoregon.org/graditude/. On Wednesday, March 7, Senate Democrats held a hearing in Washington, D.C. to discuss ways to keep gun violence out of schools. Several high school students were in attendance, including one of the survivors of the recent Parkland, FL shooting, and Hood River Valley High School sophomore, Eva Jones. Oregon Senator Ron Wyden invited Jones to share her testimony after meeting her at a town hall in Hood River during the weeks following the mass shooting in February. students who have been vocal about a need for policy change, spoke about how difficult it is to focus on learning with constant fear of an attack. "In my math class, instead of learning integration techniques, we discussed the pros and cons of hiding under our desks like we were told or tackling the attacker," she said. "But school-wide murder has been so normalized by gun culture that we approach these like a fire drill. This makes me sick…I am not content to allow my peers to try and learn in an environment like this any longer.” Jones also helped organize a walkout at her school on March 14 to garner support for the gun violence prevention movement. Oregon students stood in solidarity with their peers from all over the country on March 14. At 10:00AM, thousands of students stood up, walked out of their classrooms and observed a 17-minute moment of silence — one minute for every student and teacher killed in the February 14 school shooting in Parkland, FL. At some demonstrations, students called out the names of those who were killed, or read letters written by family members, or chanted together. Some participated to show students from Marjory Stoneman Douglas High School their support, others to express their discontent with legislators for their refusal to tighten up gun control laws, but almost all agreed: it’s time to do something. Students are no longer content to live in fear about being shot in school, and they are demanding action from our leaders. Most school districts supported activities coordinated by students to honor those killed in the Parkland shooting, but the students took the lead in organizing and facilitating their own demonstrations. Disrupted learning environments have become one of the most pressing issues that our students and educators face today, and they inhibit an educator’s ability to do their job effectively. It is clear that Adverse Childhood Experiences (ACEs) are a huge factor in problem behaviors and interrupted learning. 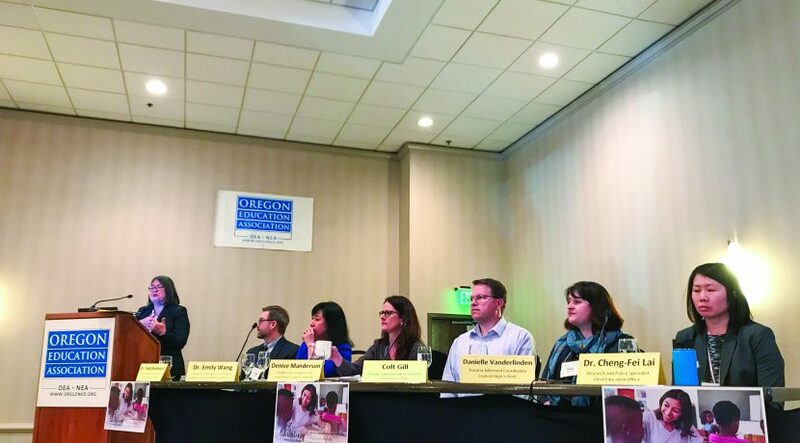 This year’s OEA Education Symposium went into great detail about what ACEs are, how they affect brain development in young people, and how trauma-informed approaches can help not only the individual student, but the classroom as a whole. During the event, OEA members had the opportunity to listen to experts on the neuroscientific aspects of ACEs and discuss how they affect self-regulation, learning attention, and students’ relationships with others. They were then able to learn about the Neurosequential Model of Therapeutics (NMT), which is highly recognized approach to working with at-risk children and is designed to help decrease crisis incidents and optimize engagement. Participants also heard from two OEA members who are involved in state-funded trauma-informed pilots in the Tigard-Tualatin and Central School Districts. Beginning at the start of the 2017-18 school year, the pilot is taking a closer look at the correlation between ACEs and chronic absenteeism. Studies show that children and teens who have experienced economic hardship, abuse, loss of a parent or guardian, or other traumatic instances are at a much higher risk for academic struggle, behavior issues, and health problems. Percentage of Oregon students under the age of 18 who have had 4 or more ACEs in their lifetime. Percentage of Oregon students who have experienced economic hardship. It is the most common ACE in Oregon, and the rate here is higher than the national average of 26 percent. Roughly the number of students who live in a home where there is alcohol or substance abuse. Amount that students with disabilities are more likely to have experienced trauma. In an op-ed piece for the Oregonian, Molalla High School teacher John Flavin expresses concern that the Oregon Department of Education is keeping educators in the dark about what they can expect to replace the Smarter Balanced assessment. ODE has said that a new testing model can be expected as early as next school year, but have yet to determine exactly which test they plan to require. This puts teachers in a predicament when it comes to preparing their students for the test; they can’t teach students to pass a test that they themselves have not studied. Flavin says that since ODE chose Smarter Balanced as their statewide benchmark test in 2015, “math and English language arts teachers have scrambled to learn the test so they could prepare their students. And now, after just three years, it’s back to square one.” He suggests that ODE suspend mandating changes once a decision has been made for at least one school year to give educators the opportunity to review the new standardized test and plan their curriculum in a way that meets state requirements without sacrificing the learning needs of their students. The Integrated Design Studio (IDS) program at Newberg High School has melded required subjects like math and language arts into a nontraditional, hands-on learning environment that creates a vision for the future of education. The course is a three-period semester-long class that is structured around learning the skills necessary to complete a community-based design project. Students learn basic construction principles, including math and language arts concepts, in the first semester. In the second semester, students in the two sections of the program must address a problem in their own community with a capstone project. 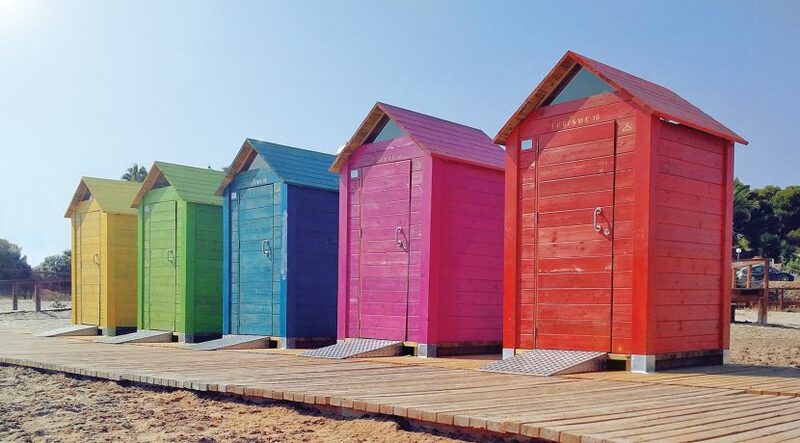 This year, students chose to tackle the housing crisis and homelessness by building two tiny houses. The program has partnered with Love INC to put the tiny houses to good use once they are complete. Principal Kyle Laier says that presenting conventional education subjects in a real-world environment gives students valuable experience that they wouldn’t get elsewhere. “Some of them have not done well in the traditional classroom and now they're getting engaged in those core subjects in a very non-traditional way,” says Laier. Over one-third of students in Oregon identify with one or more ethnic minority groups, and the achievement gap between students of color and white students can no longer be ignored. Research overwhelmingly suggests that having just one single teacher that looks like them can greatly improve a student’s academic performance, so what can Oregon do to put more teachers of color in the classroom? The Graduate School of Education at PSU thinks we need to start from the top. The program will help candidates through the application process, offer financial aid to make sure that there are as few barriers as possible, and provide mentorship during their transition to teaching in their first year. Forest Grove High School student show "Promise"
The thought of going off to college after graduation can be daunting for high school students. Rising tuition costs and academic demands are some of their biggest concerns, but Western Oregon University is aiming to put those fears to rest so students can focus on their education. The Willamette Promise is a partnership between the university and local-area high schools which gives students the opportunity to earn college credit before they even set foot on campus. Teachers collaborate with WOU faculty to align their curriculum with college-level coursework, and hold their students to grading standards used by the university. Students pay $35 per year to take as many college-level classes as they want in subjects like English, mathematics, psychology, Spanish, and biology. Forest Grove High School students are taking full advantage of this partnership, to the tune of 1,011 WOU credits earned last year. That translates into over $200,000 in potential savings, based on current tuition rates at WOU. Principal Karen O’Neill says that many students are earning enough credit to take a year or more off their total time at university, which saves them thousands of dollars on tuition costs. Forest Grove students are also relieved that they will be able to take on a more manageable workload in college. “It will be less of a burden knowing I won’t have to take those classes again,” says Briana Larios, a junior. The program allows students who are unsure if they are prepared for college-level classes – any student can sign up – to test the waters, oftentimes finding that they are more capable than they thought. "It helps kids understand college is within their reach. They can handle the rigor and it's encouraging,” says O’Neill.